On this warm , smoky October afternoon my son Sam and I load non-perishable tsog, offered the previous weekend, into our pickup truck for the short drive down the street from the Gonpa to Community Sharing. It has become part of Dechhen Ling’s yearly Tara Tsog to include bulk contributions toward the local food bank as part of our tsog offerings. Of the money people offer for buying tsog, part is used to purchase these foods. And this year canned tuna, Spam, Velveeta, soups, cereals and granola bars—all bought in bulk—again joined the fancier tsog fare on the shrine tables. Cottage Grove is like a lot of small communities, throughout the United States, that now experience what is officially called ”food insecurity”—what we know of as hunger. What was once just a fringe of people not quite getting by is now quite mainstream, with a surprising number of the official count of “homeless” being teens and children. When we arrive at the food pantry, which is based in the old Cottage Grove Hospital, I am struck by the fact that the staging area for food is the old emergency room…now practically empty except for a huge palette of Dole banana boxes. Two volunteers are sorting some recent clothing donations and direct me to where we can unload the truck. Meanwhile the Pantry Director walks up with a big smile on his face, saying something to the effect that we have answered his prayers. He tells us that they are very short on food and that of the three rooms that were full this time last year only one of them has a few shelves of goods left. When I ask him why—whether it is a lack of local donations—he says that the pipeline of food, which comes down from Portland via Food For Lane County, is basically not flowing. All the food banks in Oregon are short of supplies and meanwhile the demand has gone up. As we unload our small offering—tiny in the face of the need—I think back on the pallets full of food at Costco and how generous so many of our sangha were in offering money to purchase tsog. 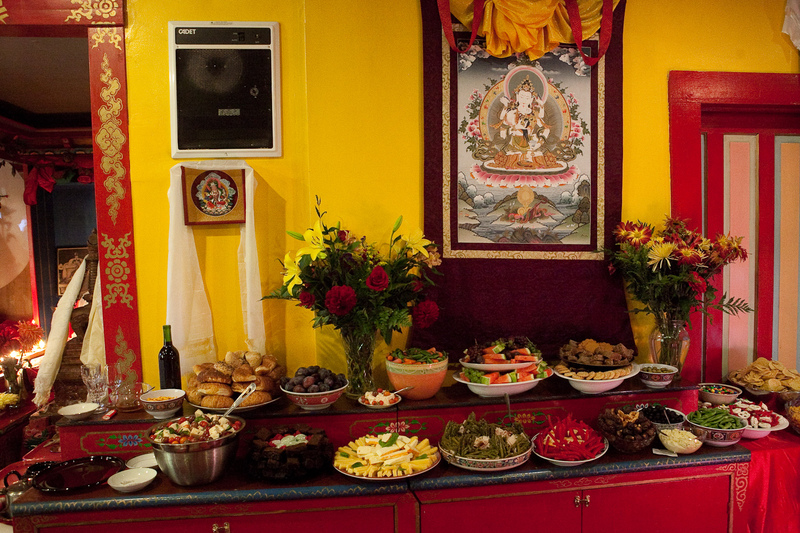 And I remember the teachings that Chagdud Rinpoche would give on intention—how even the tiniest gift of food (he would give the example of a mouthful of food to a hungry bird) can have great impact if it is offered with the wish that by this generosity, all sentient beings gain freedom from their suffering and secure lasting happiness. He taught us that with good intention even a small gift can be expanded and offered in a big way. 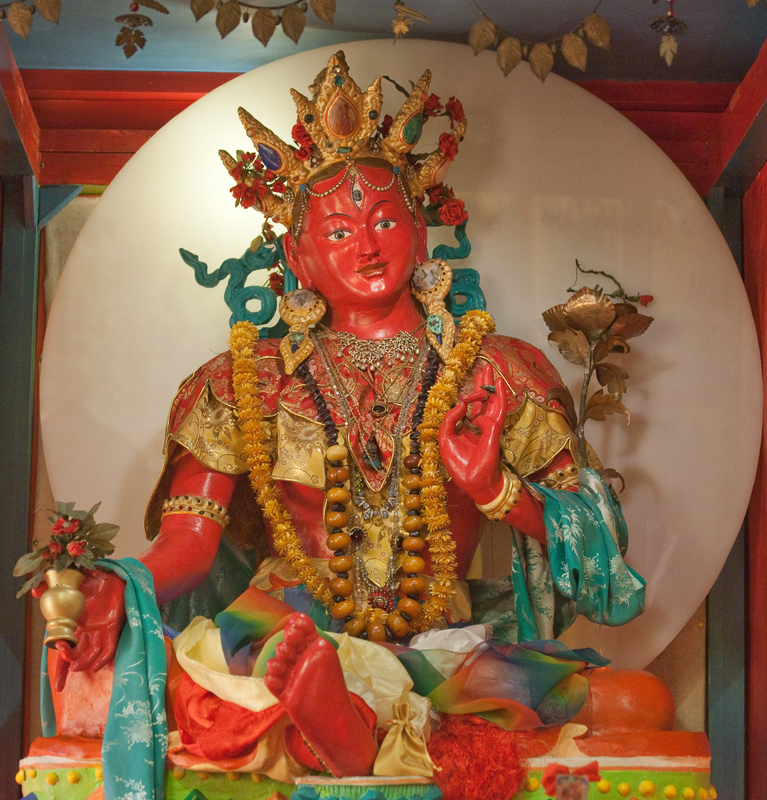 Lama Norbu spoke beautifully during the weekend about how Chagdud Rinpoche established this center, Dechhen Ling, as a field for merit; a place where people could practice the Dharma and through Red Tara practice, learn to be of benefit to others in the greatest possible way. As we place the cans and packages of food in shopping carts I can see how small the amounts are, in terms of an ordinary physical offering. The few cans of Spam, soups, and beans are barely a drop in the ocean of what is needed. But when viewed in terms of the not-so-ordinary context of their transformation through a weekend of strong Red Tara practice, maybe even the most mundane seeming bowl of ramen eaten by one hungry kid, might truly make a difference in that person’s life. I don’t believe that food banks are going to solve the problem of hunger. But as Chagdud Rinpoche taught us, it is this concern for others, the mind’s movement toward wanting to help them, rather than turn away, that is so important. Maybe it is just a drop in the ocean. But even a drop of kindness can make a big difference in the ocean of someone else’s life. Jigme Khyentse Rinpoche, Summer and Amaya at Rigdzin Ling. This July along with many South Americans I set out on a pilgrimage to North America, with the Padmasambhava Peace Institute as my main destination. Before attending the incredible event held there I had the good fortune to spend some days at Rigdzin Ling with Khadro. The heat of the California summer was such a relief, having left Khadro Ling in mid-winter. My daughter, Amaya, was able to run around in only a diaper and play with buckets of water outside. It was delightful seeing Khadro and all the activity there. She would often be in front of Tara House talking to the contractor, Lama Norbu driving the tractor and Lama Thubten heading upstairs to do the Gonla practice in Chagdud Rinpoche’s shrine room. I had only visited Rigdzin Ling once before and I was very impressed with how secluded and beautiful it is. Visiting there I imagined Chagdud Rinpoche’s time before moving to Brazil. Thinking of him planning where to build, performing ceremonies, I imagined how his hand had held that same brass rail in Tara House that Amaya was now reaching up for. It felt as though I could almost see him there now. Rigdzin Ling was hosting the annual children’s camp. It was great seeing the dynamic and compassionate interaction of the Dharma teens and children. The Lamas and parents supported the activities of the children, while the children ran a wonderful camp. Some of them would arrive for lunch in fantastic costumes, and the dinning room had a lively atmosphere. The parents helped organize creative projects that included making tsa tsas. To support their tsa tsa project they requested the Buddha Akshobya empowerment from Khadro, which she happily gave them. Even the young children seemed very focused during most of the empowerment. Also, the children did beautiful traditional drawings of auspicious symbols on the driveway (with help of parent and artist Glenn Sandvoss) to welcome Jigme Khyenste Rinpoche, who gave a teaching to the camp participants and others. Before he arrived the children had taken the volumes of the Kangyur down from the main shrine and Lama Padma carefully checked the order. Jigme Khyentse Rinpoche then taught about the history and meaning of the Kangyur at Khadro’s request. Main entrance to Rigdzin Ling with auspicious symbols that the children drew. He mentioned in the teaching that to have the Kangyur there was like being in the presence of the Buddha. The wisdom of his words made that presence even stronger. Also, he spoke about the effort made by wisdom masters and great scholars to preserve these volumes and accomplish their translation from Pali to Tibetan. I wondered as he spoke if some of our young sangha members would become future translators. Everyone felt blessed by the visit and Rinpoche’s kindness to make the long drive to Rigdzin Ling from San Fransisco. The following day he also traveled to PPI to attend the rare empowerments of the Apong Terton cycle that HH Sakya Trizin would bestow. Arriving at PPI was like arriving at a huge family reunion. Jigme Tromge Rinpoche was radiant and completely available greeting all of us as participants arrived. I was so happy to have my baby there with us. Even though she probably won’t remember, later I will tell her that she met HH Sakya Trizin and received this precious cycle. Just the fact that this cycle was given in its entirety and attended by so many linage holders felt completely historic. A blessing for the whole Chagdud Gonpa Sangha! Jigme Rinpoche and the PPI sangha were so incredible kind to make the event possible. Jigme Khyentse Rinpoche teaches the children at Rigdzin Ling, next to the stacked Kangyur volumes. Like a whirl wind as soon as the event finished many of the Lamas and participants packed up and set out on another long drive to Pema Odsel Ling to attend Dudjom empowerments being bestowed by Dzongsar Khyentse Rinpoche. Even though many of us arrived after midnight the POL staff was kindly waiting to receive participants. Again the South American practioners were there in numbers and there was a strong sense of vajra family. Lama Sonam Tsering and the other Vajrayana Foundation lamas greeted us with great care and warmth. Although I was often running in and out of the main shrine after Amaya, outside was beautifully arranged with speakers, video screen and tents for shade. Visiting these three locations left me a deep sense of rejoicing in the powerful blessings of the Buddha, Dharma and Sangha, our teachers and the strength of our sangha here and abroad. Amrita, Jigme Rinpoche and Amaya in the PPI shrineroom. Photo: PPI’s archive. H.H. 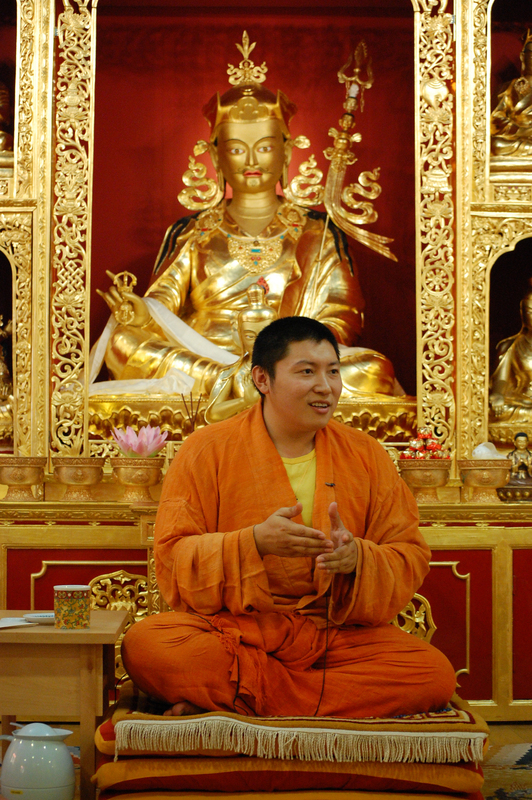 Sakya Trizen offered his heart advice on the occasion of the transmissions of the Apong Terton cycle at PPI/Ati Ling. During her recent teaching tour of Northern California, Lama Tsering was interviewed by Michele Happe on radio station KJFK Reno. 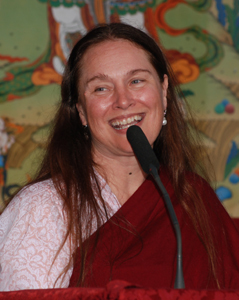 She spoke about her early years with Chagdud Tulku Rinpoche and went on to discuss the Three Yanas, Meditation and Karma. You can listen to the interview here and you can download it as a podcast from iTunes (Episode 20). Thanks to Michele Happe for a great interview! You can also listen to many of Lama Tsering’s teachings here and with iTunes.